The earliest references to Jebel Musa as Mount Sinai and/or Mount Sinai as being located in the present day Sinai Peninsula are inconclusive. There is evidence that prior to 100 AD, well before the Christian monastic period, Jewish sages had already identified Jebel Musa as Mount Sinai. Graham Davies of Cambridge University offers evidence that early Jewish pilgrimages had already identified Jebel Musa as Mount Sinai and this identification was later adopted by the Christian pilgrims. Harrison states that, “Jebel Musa . . . seems to have enjoyed special sanctity long before Christian times, culminating in its identification with Mt. Sinai.”  In the second and third centuries BC Nabateans were making pilgrimages there, which is indicated in part by inscriptions discovered in the area. Josephus places Mount Sinai between Egypt and Arabia, reflecting the standard rabbinical belief which must have been even older. Ancient Rabbinic literature describes Mt. Sinai as being the exact distance and location from Paran as Egeria who, around 381-384, recorded the distance to Jebel Musa. 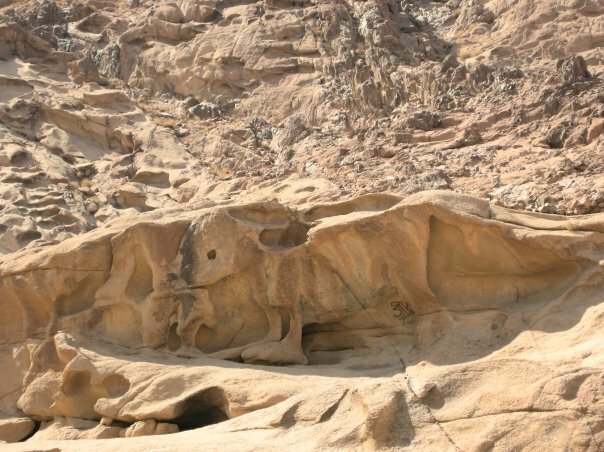 We can safely say the earliest Judaic placement of Mount Sinai at Jebel Musa was between 100 BC to 30 AD. . . . . . . . . . . . . Mount Sinai—Jebel Musa. At the very top a small chapel sits over the spot where Moses is said to have communed with God and where stone was cut out for the 10 Commandments. A rock sits on the summit which is believed to be where God descended and upon which Moses stood. This is widely held to be one of the holiest mountains in the world. Josephus wrote that “Moses went up to a mountain that lay between Egypt and Arabia, which was called Sinai.” He says that Sinai is “the highest of all the mountains thereabout,” and again is “the highest of all the mountains that are in that country, and is not only very difficult to be ascended by men, on account of its vast altitude but because of the sharpness of its precipices.”  The traditional Mount Sinai/Horeb, located in the Sinai Peninsula, is actually the name of a collection of peaks, sometimes referred to as the Holy Mountain peaks  which include the peaks of Jebel Musa, Mount Ras Safsafa, and the adjacent Mount Katherine. Etheria wrote, “The whole mountain group looks as if it were a single peak, but, as you enter the group, [you see that] there are more than one.”  Josephus must have been referring to these peaks as Mount Sinai which are indeed the highest in the country between Egypt and Arabia. The highest mountain peak is Mount Katherine, rising 8,550 ft. above the sea and it’s sister peak, Jebel Musa (7,497 ft.), is not much further behind in height, but is more conspicuous because of the open plain called er Rachah (“the wide”). Mount Katherine and Jebel Musa are both much higher than any mountains in the Sinaitic desert, or in all of Midian. The highest tops in the Tih desert to the North are not much over 4,000 ft. Those in Midian, East of Elath, rise only to 4,200 ft. Even Jebel Serbal, 20 miles West of Sinai, is at its highest only 6,730 ft. above the sea. Inscriptions with pictures of moon worship objects are found all over the southern peninsula. “The Sinaite inscriptions,” says Dr. Robinson, “are found on all the routes which lead from the west towards Sinai, as far south as Tûr. They extend to the very base of Sinai, above the Convent el-Arba’in: but are found neither on Jebel Musa nor on the present Horeb, nor in St. Catherine, nor in the valley of the Convent; while on Serbal they are seen on its very summit.” It is quite odd that inscriptions and moon votive objects appear on most every mountain in the peninsula except for that of the very mountain which tradition identifies as ‘Mount Sinai.” This oddity may suggest that the mountain was “cleansed” of pagan votives and idols and inscriptions when the sacred mountain was dedicated solely to Yahweh. Such action is consistent throughout the Bible (ie, II Chron. 34:3-7, Exodus 32:20). The southern Sinai Peninsula .contains archaeological discoveries but to place them with the exodus from Egypt is a daunting task inasmuch as the dates of the Exodus vary so widely. The Exodus has been dated from the Early Bronze age to the the Late Iron Age II  with most fundamentalists pointing toward the late Bronze age.
. . . . . . . . . . . . . . . . . . . . . . . . . “El, Save Me! Jacobovici, Adjunct Professor of Religious Studies at Huntington University, affiliate of Laurentian University in Sudbury and Investigative Journalist, deciphered some of these inscriptions as, “El, Save me!” and “O El, save me from these mines” suggesting these etchings were made while the Israelites were enslaved in Egypt. Local beduins who have long inhabited the area have identified Jebel Musa as Mount Sinai. How long this identification has been adhered by them is lost in antiquity. In the fourth century AD small settlements of monks set up places of worship around Jebel Musa. An Egyptian pilgrim named Ammonius, who had in past times made various visits to the area identified Jebel Musal as the Holy Mount in the 4th century. Empress Saint Helena, ca. 330 A.D. built a church for humanitarian reasons to protect monks against raids from nomads who were murderous thieves. She chose the site for the church from the identification which had been handed down through generations through the beduins. She also reported the site was confirmed to her in a dream. In my next article on Mount Sinai I will present hitherto ignored archaeological findings from the Jebel Musa/Ras Safsafa southern Sinai area. Also presented will be evidence that Mount Sinai and Mount Paran were not the same mountain (see Deuteronomy 33:2 and Numbers 10:12). Mount Sinai is located in the southern Sinai peninsula and Mount Paran is located in Arabia and may very well be the Jabal el-Lawz mountain. Finally I will present numerous scriptural proofs of the correct location for the true Mount Sinai. International Standard Bible Enclylopedia, 1911 Edition: Written by C. R. Conder. Bimson, John J., Livingston, David. “Redating the Exodus.” Biblical Archaeology Review, Sep/Oct 1987, 40-48, 51-53, 66-68. “The text of this website [or this page, or this section] is available for modification and reuse under the terms of the Creative Commons Attribution-Sharealike 3.0 Unported License and the GNU Free Documentation License (unversioned, with no invariant sections, front-cover texts, or back-cover texts)” so that certain articles or portions or these articles found on this website may be used by the author (CWatchman or Dr. C.D. Ward) in Wikipedia articles. Looking at the southern Sinai Peninsula, on Google Maps, you can see a a figure that looks like Moses. It appears in the center of the picture above. You can see the shape of a man, with eyes, nose, beard, etc, looking toward the right. It is been said that this is the portrait of Moses looking over to Israel. It looks as though he is sitting or standing on Mount Sinai (Jebel Musa) with his robe draped over the area as he looks over the Holy Land. If in doubt of this picture simply go see it for yourself on Google Maps at: Southern Sinai Peninsula. One must admit this is quite a chilling anomaly! The rock that is believed to be from which Moses fetched water. The twelve clefts on it, according to local tradition, represent the twelve springs described in another ancient manuscript. Locals claim that on occasion water will still flow from the rock. An ancient legend maintains that the bush near the mount is the original burning bush from which the Angel of the Lord spoke unto Moses. It is a rare species of the rose family called Rubus Sanctus. 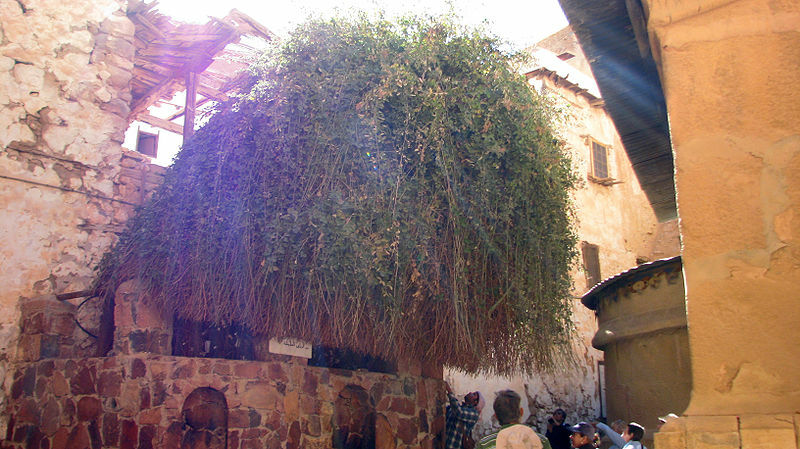 It is said that this is the only bush of its kind growing in the entire Sinai Peninsula, and that every attempt to transplant a branch of it to another place has been unsuccessful. The bush is native to Sinai and extremely long-lived, facts that help lend credibility to the site. The bush is also described in literature from the 10th century. Some maintain that if even if this evergreen bush was not the same bush it is nevertheless from the same stock as the burning bush from which God spoke to Moses. Stones near the burning bush bear fossil-like markings which are engraved in the granite rock. It is said that it was here where the the miraculous fire of God appeared in the bush and God spoke to Moses. Local guides explain that fossils cannot be seen in any granite stone, only limestones. Mt. 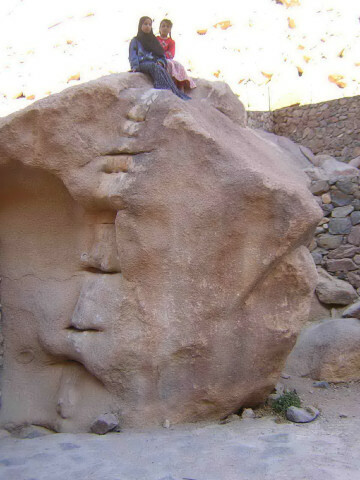 Sinai is mainly made up of granite stones. These are NOT fossils which appear in the granite stone. They explain that since God touched the mountain itself (when he gave Moses the 10 commandments), and spoke to him through the Burning Bush, the fossil like imprint appeared on the stones which look just like the Burning Bush. It seems that many believe that the patterns were caused by a divine light, so intense that the shadows of the plant were imprinted in the stone leaving the imprint which are identical to the leaves of the Burning Bush. It may be explained that the powerful spiritual radiation of the fire of God left it’s print in the rock like radiation from an x-ray machine leaves images on x-ray plates. The Jewish Midrash says the rocks would be engraved as a sign. 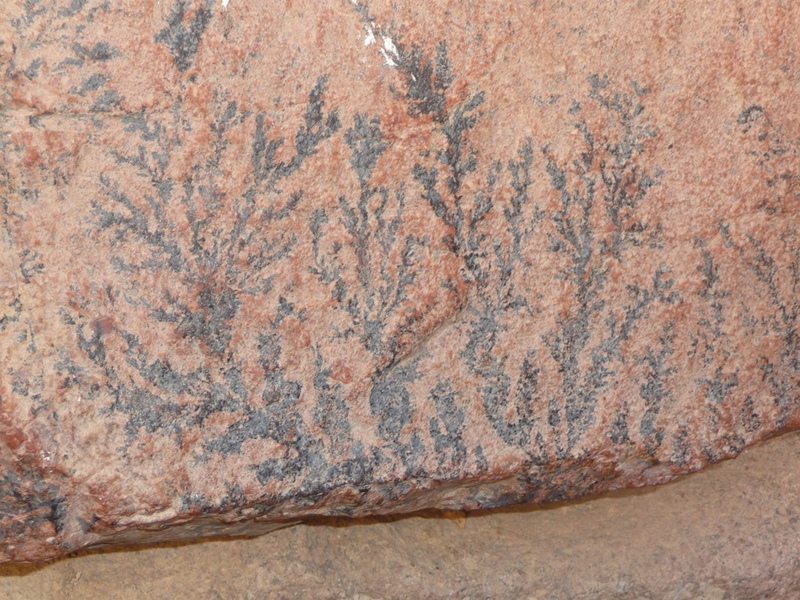 While geological dendrite type features may appear in other parts of the world, this exact form does not appear anywhere in this area except for that of Mount Sinai. Other candidates alleging to be Mount Sinai have no such sign engraved in their stones. It would stand to reason the midrash is saying, “Don’t search in India or any other ridiculous places in the world for Mount Sinai . . . look in the Sinai Peninsula and then look for the autograph God put on it.” Local Beduins, who know the peninsula intimately, attest no such autograph appears in any other mountain in the peninsula. No other mountain stones behave as Mount Sinai stones. It is not mandatory that these stones be a geographically or a radiation unique caused phenomenon. Since the omnipotent, omnipresent God fills all nature it is not impossible that he could have caused dendrite crystals formations by filling minute fissures in the rocks with mineral solutions such as iron or manganese. The burst of great light from the bush or the quaking of the mountain could have produced fissures and the later rainstorms, recorded in scripture, could have filled them. A rainbow is meteorological phenomenon that is caused by both reflection and refraction of light in water droplets but it is still it is still a miracle and a scriptural promise created by God. So what is the answer? They could be nothing but a scientific oddity. They may not be connected to Moses at all. But there are too many unanswered questions and too many coincidences for us to make a snap judgement on this unique finding right at this time. It is a very interesting subject with a long history that remains unexplained. Josephus wrote that “Moses went up to a mountain that lay between Egypt and Arabia, which was called Sinai.” He says that Sinai is the highest of “the mountains that are in that country, and is not only very difficult to be ascended by men, on account of its vast altitude but because of the sharpness of its precipices.” The traditional Mount Sinai/Horeb, located in the Sinai Peninsula, is actually the name of a collection of peaks, sometimes referred to as the Holy Mountain peaks. On the south side of Sinai/Horeb is Jebel Musa. On the north side is Ras Safsafa. They are two peaks of the same mountain. Behind Ras Safsafa you can see the peak of Mount Katherine. Etheria wrote, “The whole mountain group looks as if it were a single peak, but, as you enter the group, [you see that] there are more than one.” Josephus must have been referring to these peaks as Mount Sinai which are indeed the highest in the country between Egypt and Arabia. At the very top right of the mountain peak is the place where Moses is supposed to have communed with God. A small chapel is built over the area and there is a place cut in the rock where the original stone for the ten commandments was said to have been taken from. This is the summit of Mount Sinai which the locals call Jebel Musa. This is widely held to be one of the holiest mountain peaks in the world. This is the Southern peak of Mount Sinai/Horeb. This is the side of Mount Sinai/Horeb on which Moses may have read the ten commandments to the children of Israel. The plain in front of it is called The Plain of er-Raha. This may be where some of the Israelites camped at the bottom of the mountain while Moses was up on the summit of Jebel Musa communing with God. The children of Israel’s encampment may have extended southeast from the foot of this mountain to the foot of Jebel Musa. There is plenty of room around the mountain peaks for a multitude of people to camp. This is the northern peak of Mount Sinai/Horeb. Jebel al-Lawz is located in the area of ancient Paran. Moses prayed on more than one mountain in his long journey. (Deut 33:2) Geographically they had to have been separate mountains. I believe Mount Sinai to be Jebel Musa, and Mount Paran to perhaps be Jebal al-Lawz. Notice that Jebel al-Lawz has a charred mountaintop the same as Jebel Musa has. This is traditionally held to be the rock on which God in his glory descended to speak to Moses and where God stood to give the ten commandments. Moses is believed to have stood on the rock at a later point. This is the highest peak on Mount Sinai. This is believed to be the cleft in the rock where Moses was hidden as God’s glory passed by. The imprint of Moses’ back, head, and hand are said to be imprinted in the rock. This is a different angle of the rock traditionally believed to have been where God stood, where Moses later stood, and underneath is believed to have been the cleft Moses was hidden in. This is also believed to be the cave where Moses prayed and waited for The Ten Commandments. I hope no one starts shouting and dancing! According to tradition, this is the well of Moses. These are two views of the same cave where it is believed Moses and Elijah lodged for 40 days on Mount Sinai (the cleft in the rock is the cave where Moses prayed and waited for The Ten Commandments, while this cave is where he and Elijah respectively dwelled). In the future I will be writing much more on this subject. I hope I have convinced you in something which was presented here that Mount Sinai IS in Sinai. The earliest references to Jebel Musa/Ras Safsafa as Mount Sinai and/or Mount Sinai as being located in the present day Sinai Peninsula are inconclusive. There is evidence that prior to 100 CE, well before the Christian monastic period, Jewish sages had already identified Jebel Musa as Mount Sinai. Graham Davies of Cambridge University offers evidence that early Jewish pilgrimages had already identified Jebel Musa as Mount Sinai and this identification was later adopted by the Christian pilgrims. He argues that around 100 CE that rabbinical literature described the distance between Pharan and Mt. Sinai as 36 Roman miles, almost exactly matching the later figures of Egeria (who visited Jebel-Musa around 381-384) of 35 Roman miles Pharan-to-Jebel Musa. Harrison states that, “Jebel Musa . . . seems to have enjoyed special sanctity long before Christian times, culminating in its identification with Mt. Sinai. In the second and third centuries BCE Nabateans were making pilgrimages there, which is indicated in part by inscriptions discovered in the area. Antoninus Martyr provides some support for the ancient sanctity of Jebel Musa by writing that Arabian heathens were still celebrating moon feasts there in the 6th century. Scholars have theorized that Sinai in part derived it’s name from the word for moon which was “sin” (meaning “the moon” or “to shine”) The etymology of the name Sinai may indicate that the mountain was “holy” even before the time of Moses. Since the etomology of the word “sinai” is believed by scholars to be derived from the word for moon and moon worship then wherever the original Mount Sinai was located would most likely be a place of moon cult. Therefore to locate the placement of the original mount one should study an area in which moon worship was most prevalent. Dr. Geraldine Pinch (PhD) says that some figurines, bowls and pottery which has been discovered at Timnah could date to the 18th dynasty. She also suggests that religious offerings were being made during this time. Many scholars believe that Mount Sinai was of ancient sanctity prior to the acsent of Moses  The Sinai peninsula has an ancient history of being a center of a moon cult and was sacred to ancient moon worshipers. It stands to reason that a mountain with such a name as Sinai would most likely be situated in such an area as the Sinai Peninsula. Placentinus describes how c.570 a.d. a white marble idol, representing the moon-god, was still being worshiped on the traditional Sinai by the native Arabs at every new-moon. Ancient Arabs and Egyptians would have christianed a sacred moon mountain with the name of Sinai which is the name we find the sacred mountain of Moses was named. The descendants of the ancient area Arabs are the modern bedoiuns whose consistent legends and oral history points toward Jebel Musa as the original Mount Sinai. It would stand to reason that although Moses received a “revelation”of monotheism, which both he and Israel did not consider a moon-god, that the well known name Mount Sinai nevertheless retained the name ingrained in the minds of the locals. Hobbs writes about the “banana-shaped”rise at the southern end of the plain of er Raha  which actually seems to be more of a moon cresent shape. Inscriptions with pictures of moon worship objects are found all over the southern peninsula. “The Sinaite inscriptions,” says Dr. Robinson, “are found on all the routes which lead from the west towards Sinai, as far south as Tûr. They extend to the very base of Sinai, above the Convent el-Arba’in: but are found neither on Gebel Mousa nor on the present Horeb, nor in St. Catherine, nor in the valley of the Convent; while on Serbal they are seen on its very summit.” Yahweh had expressly forbidden idols or other objects to be used in worship. It is quite odd that inscriptions and moon votive objects appear on most every mountain in the peninsula except for that of the very mountain which tradition identifies as ‘Mount Sinai.” This oddity may suggest that the mountain was “cleansed” of pagan votives and idols and inscriptions when the sacred mountain was dedicated solely to Yahweh. Such action is consistent throughout the Bible (ie, II Chron. 34:3-7, Exodus 32:20 ). Egyptologist Geraldine Pinch says that some figurines, bowls and pottery which has been discovered at Timnah could date to the 18th dynasty. She also suggests that religious offerings were being made during this time. In the first century (60 AD) Josephus reflects the standard rabbinic belief concerning the location of Mount Sinai when he writes “Moses went up to a mountain that lay between Egypt and Arabia, which was called Sinai” which appears to be the geographic Sinai Peninsula. He provides other evidence which leads to Jebel Musa (see above). Elijah made a prilgrimage to Mount Sina in the era of 1 Kings (I Kings 19:18). Local beduins who have long inhabited the area have identified Jebel Musa as Mount Sinai. How long this identification has been adhered by them is lost in antiquity. In the fourth century AD small settlements of monks set up places of worship around Jebel Musa. An Egyptian pilgrim named Ammonius, who had in past times made various visits to their area identified Jebel Musal as the Holy Mount in the 4th century. Empress Saint Helena, ca. 330 A.D. built a church for humanitarian reasons to protect monks against raids from nomads who were murderous thieves. She chose the site for the church from the identification which had been handed down through generations through the beduins. She also reported the site was confirmed to her in a dream. Julian Sabian built a church there c 360 Ad. During Justonians rein (527- 565) he established the presence of of St Catherines monastry on the NW slope of Mount Jebel to replace a church which was built there two centuries earier. In 542 Justian 1 built a a fortress-like basilica to protect the church form wandering mauraders. Legend says Saint Catherines body was transported miraculously by a band of angels to Katrina and her supposedly uncorupted body was removed to the monastery where her remains rest there to this very day. 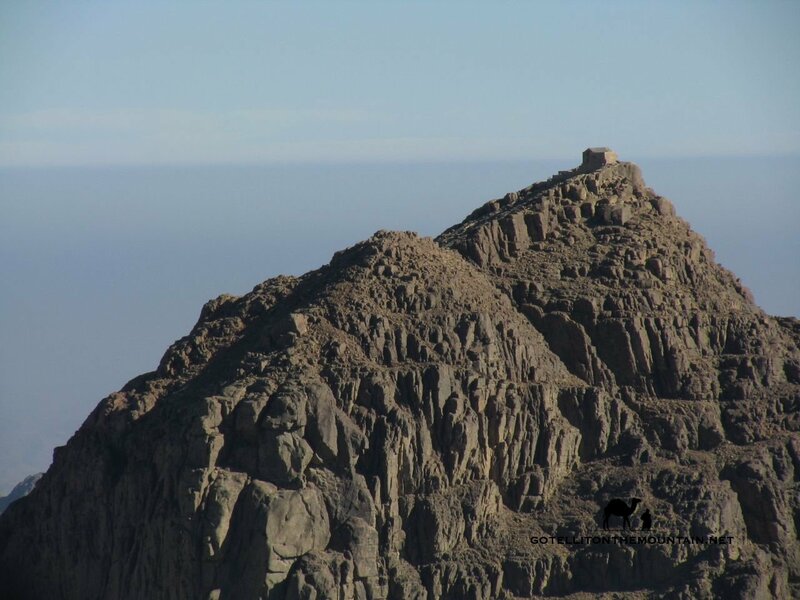 Mohahammed, prophet to Islam and believer of Jebel Musa as the true Mount Sinai, gave his personal pledge of protection to the monastery and to the three mounts and his pledge is honored to this very day. 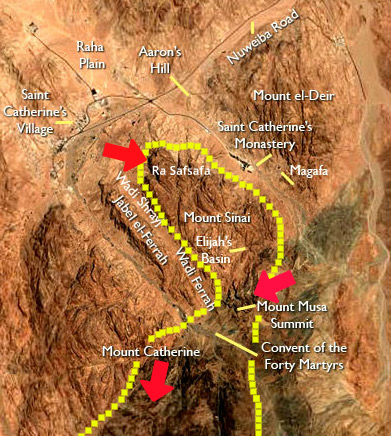 The Israeli occupation of Jebel Musa of 1967 resulted in a paved road to Jebel Musa for Pilgrims who wished to travel to the the sacred mountain which was believed to be Mount Sinai. It was not until Lepsius’ proposal in 1845 that any other specific mountain but the traditional Jebel Musa was ever suggested for Mt. Sinai. So, we have no other contenders for the title of Mount Sinai except for Jebel Musa during the impressive span of time from around 100 BC to 1845 AD. 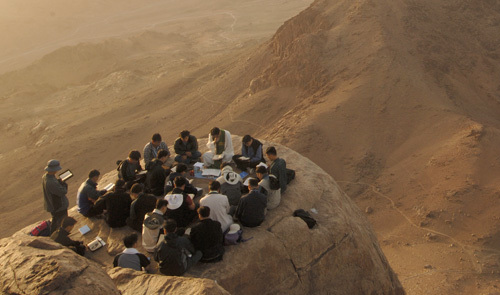 Nine groups of nawamis have been discovered in southern Sinai, creating a kind of ring around Jebel Musa (Mt. Moses).These circular buildings were constructed using sandstone slabs. It is thought that the Nawamis were probably ancient burial chambers but no one knows the identity of the people buried there. There are more than 30 Nawamis next to the road from Nuweiba to St. Catherine’s Monastery. These ancient dwellings of unknown origin have been reused for many centuries. They are like stone igloos in appearance. Dating of the nawamis is difficult because they have been disturbed consistently through the ages. This means that our dates for the nawamis remain somewhat speculative. 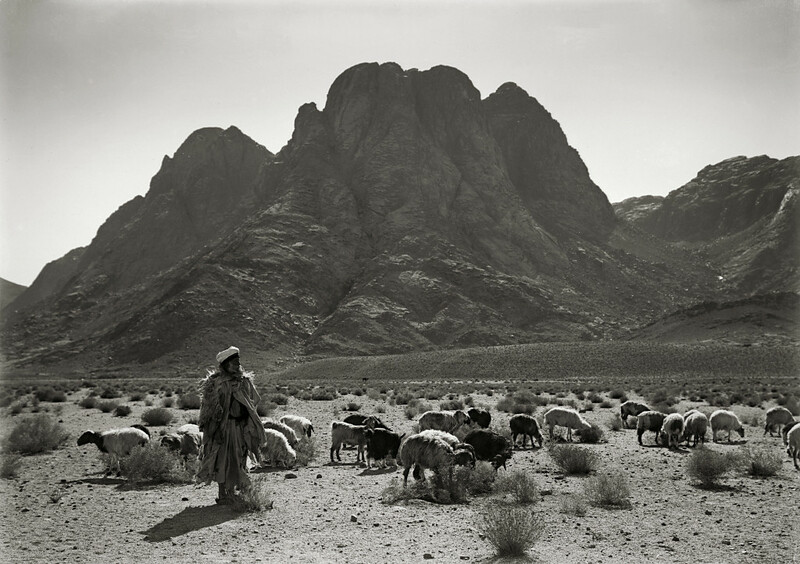 Many were built around 4,500 BC by nomadic herders and are the worlds oldest remains of a pastoral nomadic society. The nawamis were used over and over throughout the centuries for various purposes. They were used as burial places and centuries later used again for burial purposes for other deceased persons. One nawami contained a skeleton less than 100 years old. They were used in various times throughout history as huts or temporary homes from the elements. Red Sea shell bracelets were found in some of them which are are known from the Chalcolithic period (c. 4500-3500 B.C.) site of Tell Abu Matar, near Beer-Sheva, Israel, and from the Chalcolithic/Early Bronze sites (late fourth millennium B.C.) of Bab edh-Dhra in Jordan and Tell el-Farah (North) on the West Bank of Palestine. As stated, the Nawamis were used over and over throughout the centuries as burial places or as circular huts in which to dwell in. A pilgrimess, called Etheria or Egeria, circa the 4th/5th century A.D., kept a diary of her visit to Mount Sinai, and she noted that her guides, who were the local “holy men, pointed out round or circular stone foundations of temporary huts, and they pointed out first the place where the camp of the children of Israel stood in the days of Moses when he went up the mountain … then they showed how each and every one of them had dwellings, the foundations which are still visible today throughout the valley, and how they had been built in a circular shape out of stone.” (p. 57. George E. Gingas [Translator]. Egeria: Diary of a Pilgrimage.New York, N.Y. & Mahwah, New Jersey. The Newman Press. 1970)She affirmed the Israelites lived in these nawamis which surround Jebel Musa. The southern Sinai Peninsula contains archaeological discoveries but to place them with the exodus from Egypt is a daunting task inasmuch as the projected dates of the Exodus vary so widely. The Exodus has been dated from the Early Bronze age to the the Late Iron Age II  with most fundamentalists pointing toward the late Bronze age. For example the sharp twin peaks of Jebal Musa and Mount Saint Katherines is only 1 minute or 0.2 miles apart. Thunderstorm clouds may suddenly form, lasting for days, are apt to cap very lofty mountains and produce plasma phenomonon through sharp peaks. Grazia writes, “The discharge will seek outlets through tooth-like (Sinai=Sinn=Tooth? ), sword-like (Horeb=sword), and especially quartz-loaded eminences.”  Descriptions in Exodus 19:19, 20:18 and Judges 5:4 could be read to suggest plasma phenomenon connected with mountain thunderstorms. Strange sounds have blasted from Jebel Musa even in the absence of a storm. Stanley refered to “the mysterious noises which have from time to time been heard on the summit of Jebel Musa.”  It was reported that the monks at Jebel Musa “had originally settled on the highest peak, but were by these strange noises driven down to their present seat in the valley.” An Arabian legend attributes the loud sounds on Jebel Musa “to a fairy maiden, who fires off a gun one day in every year to give notice of her presence.”It is believed these sounds result from some disturbance of sand which has long lain undisturbed. True God could have used plasma phenomenon or sand displacement to get the attention of the ancient Israelites. This is a good substitute for critics who adhere to the volcano theory. But in reality why would an all powerful being need to use anything other than his divine Word? But I believe that divine Word was given to Moses at Jebel Musa. Instead of “volcano hunting” lets look scripturally for an actual place where God Spoke to man. No other place fulfills all requirements as does Jebel Musa. The traditional Mount Sinai/Horeb, located in the Sinai Peninsula, is actually the name of a collection of sharp peaks of the SAME MOUNTAIN, (Jebel Musa and Ras Sufsafeh, with Jebel Katherina adjacent to the twins peaks) and are sometimes referred to as the Holy Mountain peaks. For example the sharp twin peaks of Jebal Musa and Mount Saint Katherines is only 1 minute or 0.2 miles apart. Some consider the whole mountain as Mount Sinai while others prefer to call just one of the peaks of the mountain “Mount Sinai. “It is actually thought that Horeb was the name of the whole mountain while Mount Sinai is the name of the southern peak which is also called Jebel Musa). Some think Moses communed with God on one peak and then moved over to the other peak to pronounce the laws he received to the children of Israel in the plain below. Josephus wrote alluded to the peaks saying, “because of the sharpness of its precipices: nay, indeed, it cannot be looked at without pain of the eyes.” Some Bedouins in the area asert the name Sinai came from the Arabic word for “tooth” (sinn) because the jagged peaks resemble the the teeth through which the mouth of God spoke. Interesting, except that there are no mountains on Sinai that would fit the travel description in Exodus. The Sea and Reeds and the Red Sea both refer to the Gulf of Aqaba, that is the sea God parted for Moses and the Israelites.